vendredi 31 janvier 2014, par Julia Duchemin. 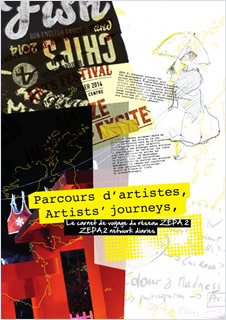 Universities have a key role in the ZEPA 2 project, as they contribute to developing research around outdoor arts. To facilitate this, a series of information sessions and events will be organised between outdoor arts professionals and students in 2014. As part of its fruitful partnership with the Université de Rouen, Atelier 231, will be organising several events on themes related to outdoor arts : organising arts events with a European dimension, dance in the public space...In this context, an information session was held on Wednesday 29th January 2014 at Atelier 231 between the Master 2 students from the Master in Cultural Management and ZEPA 2 members. The purpose of this meeting was to help the student understand the process of constructing European artistic projects and to fuel their knowledge of outdoor arts in particular and of art in public spaces in general. What are the stakes, the prospects, the constraints in building cross-border artistic events ? What role can the various partners play in this ? To answer these questions, UK and French speakers were invited to present their work, confronting different ways to elaborate a project. In order for the students to fully grasp the logic of European artistic cooperation, it was necessary to present the different European funds and programmes. 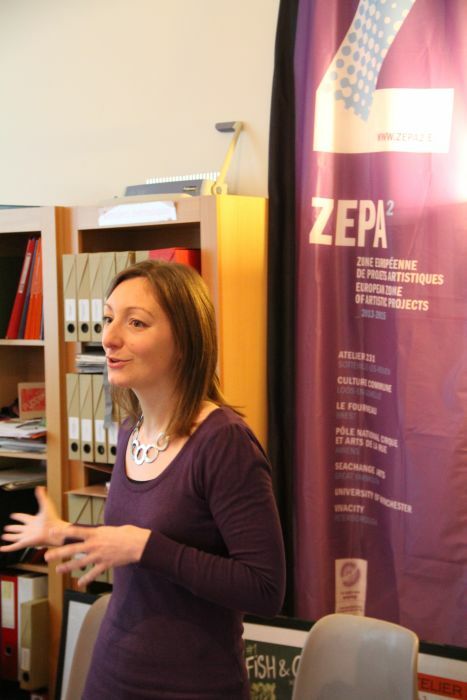 Martha Métais, territorial correspondent at the Joined Technical Secretariat (JTS) from the Interreg unit of the Région Haute-Normandie presented the cross-border cooperation programme Interreg IVA France (Channel) – England, funder of the ZEPA 2 network, by explaining its objectives and priorities. This presentation was a first step in the understanding of the process behind the production and the programming of artistic projects in Europe. Mathilde Vautier, ZEPA 2 general coordinator, talked about the origins of this network that is dedicated to the development of outdoor arts : the seven partners, the progression and the objectives : commissioning, supporting creation, residencies, the collaboration between companies, outreach and community work. Daniel Andrieu, Atelier 231 director, explained why Atelier 231 took part in this network and how the network lived through this organisation and how it fitted in Atelier 231’s different actions. He also talked about the important responsibilities of the lead partner in such a project. Joe Mackintosh, director of SeaChange Arts, one of the seven partners and located in Great Yarmouth, UK, offered a different perspective on this European project. Sharing his own professional experience, background and the constraints they meet in UK, he showed a different view of outdoor arts and more generally of the arts sector. This allowed the students to confront two visions and to see the artistic and human enrichment that are to be expected from such collaborations. Joe Mackintosh also showed how the UK companies and UK outdoor arts sector in general could benefit from this project.